We are extremely pleased to announce Kaitlyn McCleary as our 2017 Year 6 Scholarship recipient. The Watsonia RSL provides a scholarship to schools in their neighbourhood to students who show exemplary behaviour in and around their school. 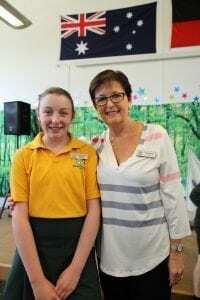 Kaitlyn has shown such promise in her commitment to her education, in every way, including her dedication to being this year’s Auslan & Communication Leader, our extremely reliable bell monitor, and leading her peers in her student leadership qualities. Kaitlyn has been instrumental in running craft projects for our Social Enterprise Program, supporting our P&F fundraising events with eagnerness second to none, and being a supportive friend in and out of the classroom. We are thrilled to have watched Kaitlyn represent herself with maturity beyond her years, and are sure she will continue to build on her capacities throughout the rest of her educational years as she enters secondary college next year. Kaitlyn will be presented with her Award at the Watsonia RSL Remembrance Day ceremony on Saturday, 11th November 2017.